Looking at the terrific artists who will perform at Dekmantel Festival 2019, you don’t need to be genius to tell where all musical connoisseurs form around the globe will be from the July 31 to August 4. Exactly, they will probably be dancing under the trees of the Amsterdamse Bos to a broad roster of heritage acts, contemporary favorites and breaking talents. But to be honest, as you read this blog, I don’t have to tell you anymore about the Dekmantel Festival 2019! But what surprises me every year is the musical knowledge of the Dekmantel team. 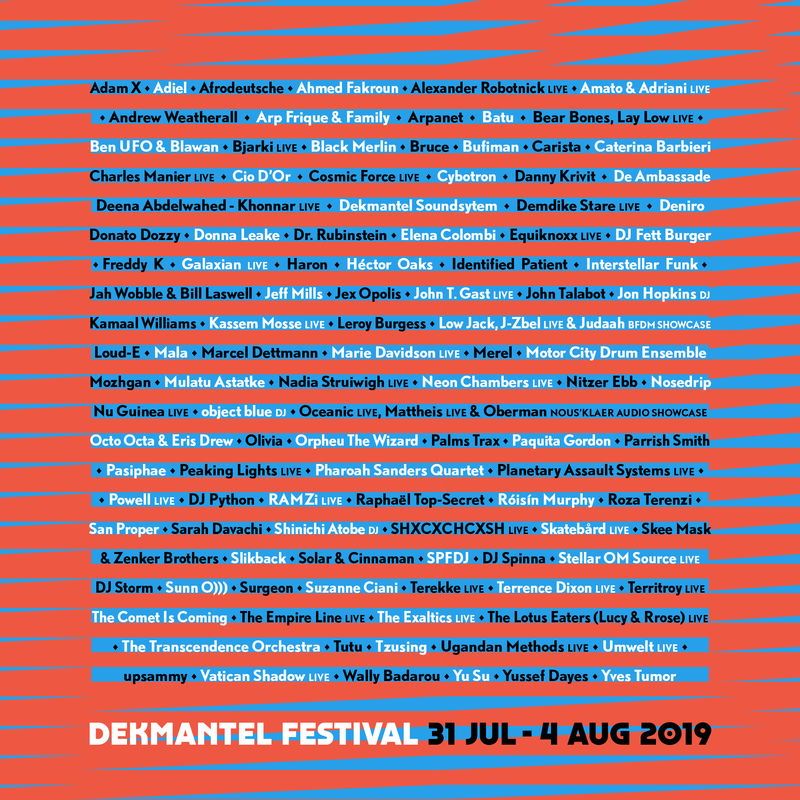 Of course, I know a bunch of the performing acts, but at Dekmantel Festival 2019 will be so so so many artists I’m super keen to discover and haven’t heard from before. And the best: I know I won’t be disappointed. An come on! Be honest! You don’t know all these fabulous artists, do you?! So, now, I don’t think I have to tell you more about the Dekmantel Festival 2019, its artists or heritage. If you’re still not 100% sure, if the Dekamtel Festival 2019 is worth it, you should listen to the recordings from last year! And after you have listened to all these magnificient performances, you will hurry and grab one of the last tickets for the Dekmantel Festival 2019! Ah, btw, this year each artist was revealed with a customized flyer, envisioned by Studio Creme and designed by Studio Colorado; these can be found on Dekmantel’s Insta page.